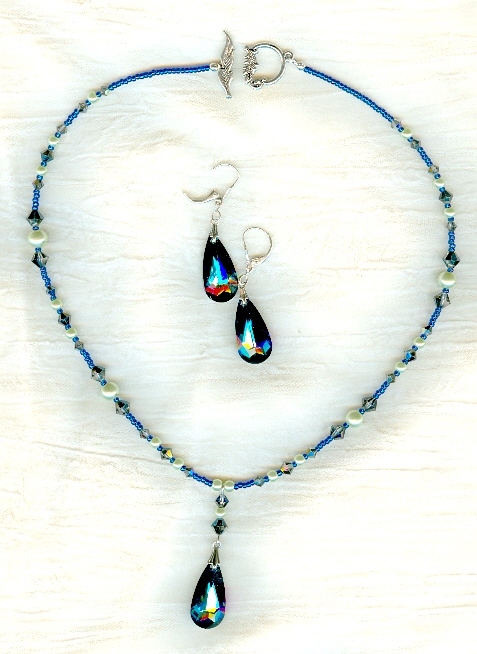 Swarovski Crystal's Bermuda blue flashes deep blues and spectacular greens in the teardrops and bicone beads in this lovely jewelry set. 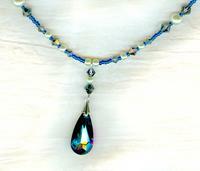 There are also pale green glass pearls and cobalt seed beads to set off the crystal beads to advantage. The necklace's pendant ends just 1-7/8" below the 17" strand. The clasp is a silver tone pewter toggle. 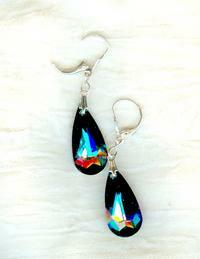 The earrings measure 1-7/8" from the tops of their sterling silver leverback findings to the bottoms of the teardrops. It's a gorgeous colour in an elegant design at an affordable price; naturally, it's from SPARKLE PLENTY. The spring colours in this set are a joy to behold! Now HERE'S a marcasite, Swarovski crystal and sterling silver earrings extravaganza that must be seen to be believed.